The following CDs are by my friend and colleague Glyn Edwards, I recommend them to all my students as I believe they are essential reading & listening for al those interested in unfolding their mediumistic, psychic & spiritual awareness. 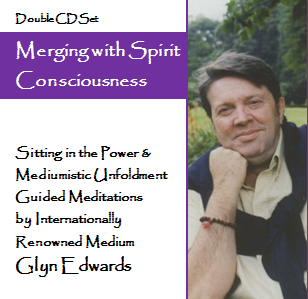 On this double CD, internationally renowned medium Glyn Edwards guides you through two essential practices for the unfoldment of your mediumistic, psychic and spiritual potential. This is the original 2002 version of the exercise for mediumistic, spiritual and psychic unfoldment. It was given through the trance medium Mark Webb, by his spirit control James. James asked me to teach the exercise and experiment with it. He prophesied that the results of the practice would be remarkable in the way that it helps people to expand their awareness and recognize their relationship with the Divine and the spirit world, including their individual spirit and its influence. This practice focuses your awareness onto your senses and how you feel and sense energy and vibration, focusing predominately on colour. As you are guided through a landscape filled with wonderful colours, you are encouraged to become aware of how you sense, how you become aware. By working with this meditation, you can come to understand how your awareness functions, how your senses function and therefore you can come to understand how to you can progress in your own spiritual unfoldment. The meditations on both CDs include soft background music by Sadhana. On this superb double CD Glyn Edwards will lead you through two extremely beneficial and practical exercises for spiritual and mediumistic unfoldment. It includes a completely new and revised version of the ever-popular Sitting in the Power exercise, coupled with a previously unrecorded and invaluable practice for deepening mediumistic awareness. This exercise is for mediumistic, spiritual and psychic unfoldment. It was given through the trance medium Mark Webb, by his spirit control James. James asked me to teach the exercise and experiment with it. He prophesied that the results of the practice would be remarkable in the way that it helps people to expand their awareness and recognize their relationship with the Divine and the spirit world, including their individual spirit and its influence. Indeed, it has proved to be one of the most beneficial exercises that I have used in development workshops. It now starts each day of many of my courses. Please be aware that this CD was originally recorded in 2005 by Glyn after a period of illness and some of his speech is not as clear and distinct as on his previous recordings.